Since the end of the 20th century and after the early economic recessions of the 21st century our ability to indemnify workers for their toiling has not only stagnated from a wage standpoint, but it has also dropped from a jobs creation standpoint. 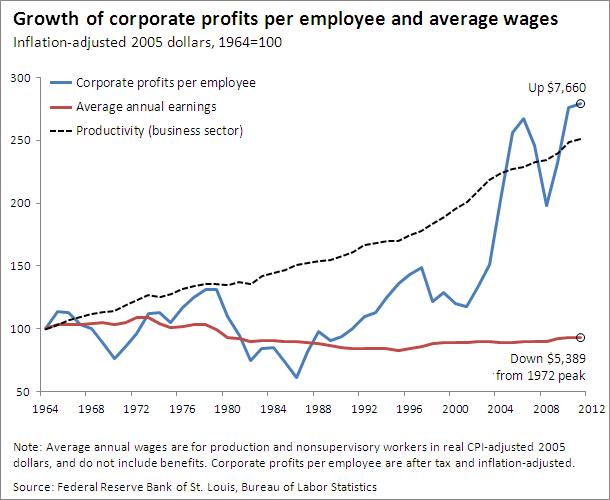 Fewer people are working and for less money, because of the growth of money in the system and its production. As mentioned in previously and in a recent article, capital is not to blame here, as it is a technology. Capable of distributing values of sorts under a denomination that we call money, capitalism is a system of distributing values and that is all. What we lack as a society or group of societies across the planet are sufficient ways to distribute value. Energy: chemical energy can be converted to kinetic energy in the explosion of a stick of dynamite. Value: institutional profits can be converted to individual wages, in the remittance from employer to employee. Specific to values and because we currently have less jobs garnering less wages, it doesn’t mean that the the value is lost. 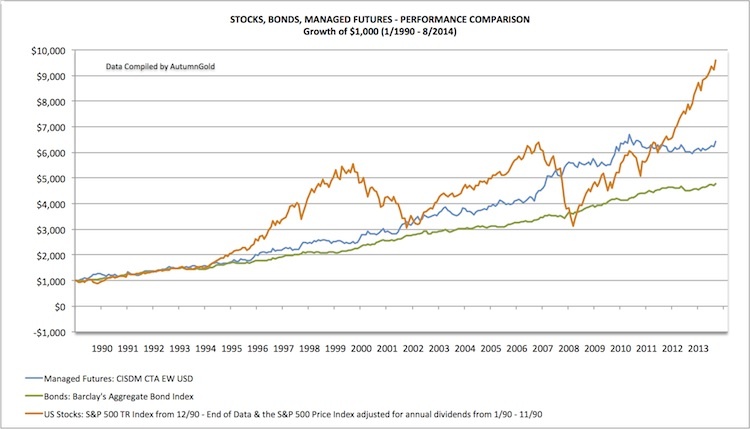 Value still exists in the trillions of dollars in the equity (stocks, futures, forex) and debt (bonds) markets. Going forward our financial innovations need to be geared around tools and methodologies to attract more people to the markets in order to consume their share of the tangible value in the world. The only realistic method to ensuring that the wealth gap between the haves and the have-nots shrinks is to give everyone the opportunity to accrue: gather and store their value. Further, individuals need to be able to own their value and convert it to wealth in the denomination of a trusted currency over time. Economic engineers and strategists need to focus, not only on the economic benefits of having more participants in the markets, but also the social benefits: added security, buoyancy in market movements, adequate consumption of goods and services. 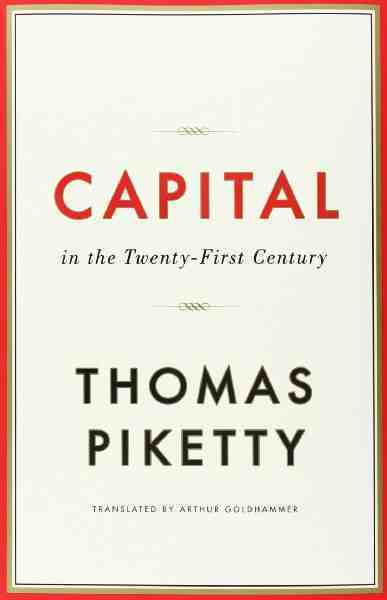 #Capital in the #21stCentury by #ThomasPiketty is a hot book right now. Great! It’s not new news tho. Capital is a #methodological #Tech, that is all. Social constructivists will always argue that it has #runAmuck because they don’t understand technology as being #deterministic, which it (tech) is. Tech only comes in 3 forms: #methodology, #hardware, #software. Just as #Feudalism (social class) evolved into #Capitalism (economic class), a new system is emerging where we will again expand the distribution of #value. I just happened to be out at a festival in Brooklyn this past week and there was a table from the AK Press, as there are frequently. On the table are a few dozen pamphlets with Anarchist reads. so I took about 20, just to see what the people at this particular event are taking in. I’m not sure how many people were reading this stuff, because I was the only person asking questions at the free literature table for at least 30 minutes. This text Capitalism, class and class struggle for (ex) dummies tries to sum up capitalism in a friendly way, they even call the readers (ex) dummies. I’m unsure who the authors are, as they weren’t presented, but I do know that it came from someone or many @IOHNYC via @libcomorg & @AKPressDistro. This critique will be short and is specific to Integrationalism which is the notion that we are all physiologically connected; based on my previous writings on “Human Nature / Technological Determinism / Competition as as spawn of Individualism”. The brief read was entertaining, and the use of prose made their concept of capitalism digestible. It elaborates that capitalism was established by other-than “natural” forces. More specifically: violence and imperialism. Sorts of politics by the first advanced countries in Europe as they aimed to compete for scarce resources. Technology is deterministic when applied to the human condition. Individualism has spawned competitive events resulting in arbitrage. The term nature will forever be ambiguous, because of its reference to the physical world; and as we are physical entities, all that we can know is a apart of the physical world/realm. “Natural” can also reference a nostalgic or more primitive state of existing socially and technologically. This is where I have to assume that the argument for capitalism by force (for lack of better phrases) stems. This notion of force is a false, as the first technologically elite nations fought over scarce land, resources, and allusive faiths. This competition stems from the inherent arbitrage that already existed by a more primitive brand of capital from tribal times: land & people. We live in a dynamic physical realm where growth is essential to our survival. Human-kind is inherently ambitious in this regard. While it is impossible phenomenologically for human’s to actually have a nature about themselves, the one thing that we’ve always tried to do is control our situation to better manage the risks of uncertainty. It’s not an ill mission, but the pathology of our altruism often shows that it is our most stifling virtue. Projecting our idea of greatness onto the entire population is not progressive, even as technology progresses. we must compel growth via our technologies. Regardless of the horrible brand at places like http://capitalism.org/ the economic phenomena (not system) of Capitalism is human-kinds most technologically advanced attempt at distribution of values, and while it has its flaws, the growth and ability of our information tech and bio tech will allow us the opportunity (if we so choose to seize it) to better distribute value and compel growth by participation of persons. This text called Capitalism for (ex)dummies is misleading and a dangerous attempt to bring attention to one of the most important issues of any time. Yesterday a psychologist friend of mine sent me this article along with a few other folks to ask if she should be getting into this field of study. Here is my response via email. ooooh thank you for this article. I think that you should be studying this…..I’d love to drop everything and do a deep dive into this. I particularly like this quote from the article. 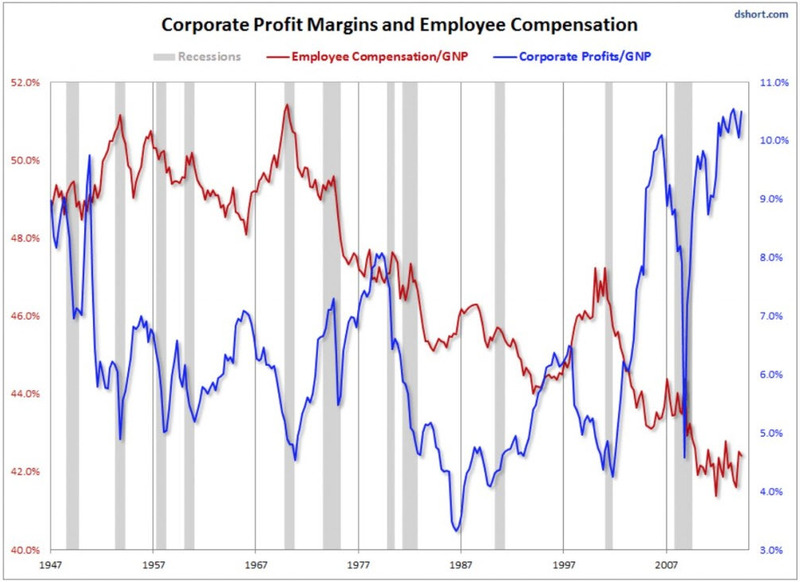 This also feeds into that article that we are supposed to be doing about the PTS that I’m almost sure that the long-term out of work has….it would be the flip-side of psychopathic capitalists mis-judging the “wealth creators” as Deresiewics put it. I almost resent how accurate Ayn Rand’s rational self interest is, which is why I think that there are only technological solutions to sociopathic and psychopathic culture. There have to be quantifiable checks and balances….because humans do a poor job (and have always) at evaluating risks and allocation resources. We can still be human or humane and operate in sync. While at MSU this associate professor that attended my philosophy clubs took-a-stab to sum all of this up as “the contradictions of capitalism”, but these problems are not inherent to capitalism…they are just a spawn of our understanding of our own individualism. it what makes Ayn Rand so fearfully, spot on. But again, all I think that we can suggest are the error-proofs (Ron knows what I’m talking about)…I don’t see how there are solutions other than technological ones (methodological, hard/softwares), that could pervade a group (of any size) of individuals. The Dumbest Idea In The World? Roger Martin thinks the culprit behind the sorry state of American capitalism: our deep and abiding commitment to the idea that the purpose of the firm is to maximize shareholder value. 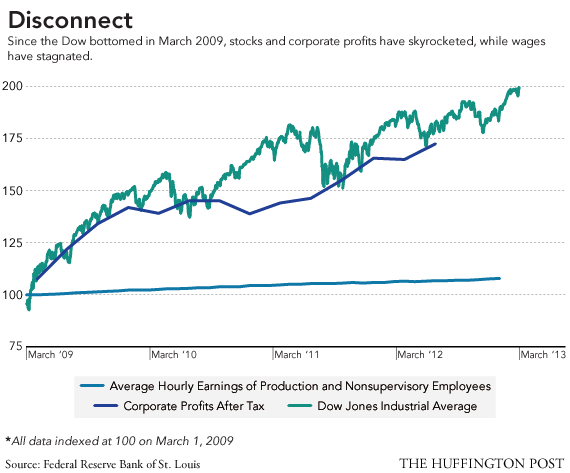 Is there any way to disincentivize profit seeking run-a-muck? These are the questions that this book doesn’t answer, it merely sheds light on the problem. But the sport analogies were nice :-). The definition of “value” also varies depending on the stakeholder and their time/cost (risk) threshold. In the next Integrationalism book I’ll elaborate on remedies to curb the potential for rational-self-interest and collusion to run-a-muck. These remedies will be centered around better distribution of ownership over assets of sorts. Forbes.com Video Network | Forbes 400: Buffett, Jay-Z On The Power of Luck. Luck of the draw is what it’s called…hearing Buffet and Jigga talk about how lucky they are, rather than talented is entertaining indeed, but also makes me a bit uneasy when considering the hypocritical regard they (Jigga especially) have for their success, as to say that they are “smart” or that anyone could every be for that matter. This interview brings into question the whole concept of elitism and the bearers of it. Acknowledging that being in the right place at the right time matters, and assuming ownership of a large amounts of wealth is hypocritical in itself because of the inability of the individual to consume so awesomely….or is it? LOL….Down with elitism! Spread the wealth! Maximize the potential of the species!